From 1997 to 2005 Richard Dean Anderson was Colonel Jonathan “Jack” O’Neill in the successful science fiction series Stargate SG-1. At the end of the eighth season he left the cast to have more time for his family. Guest appearances followed in the role of General O’Neill in the other seasons as well as the offshoots Stargate Atlantis and Stargate Universe. Anderson was also the executive producer for the series hit. The actor who grew up in the USA (with Scottish and Swedish-Norwegian descent) made his breakthrough in the middle of the 80’s as Angus MacGyver in the series of the same name. As an imaginative agent of the Phoenix Foundation Richard Dean Anderson “tinkered” in this role with chewing gum & Co. for seven seasons through almost unsolvable assignments. In September 2004 Anderson, who among other things actively supports the environmental organization Sea Shepherd, was honored with an award for his role as actor and executive producer of the series Stargate SG-1 and the positive performance of the United States Air Force at the 57th Air Force Anniversary Dinner and was appointed Brigadier General on an honorary basis. 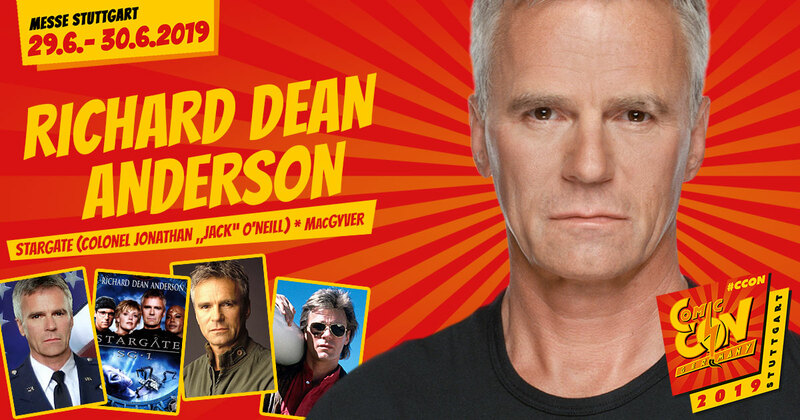 We are delighted to welcome Richard Dean Anderson to the CCON | COMIC CON GERMANY in Stuttgart. Get your ticket right now.